Monday Quiz - Wayne I ask 4 questions about you - you answer them on your blog and ask a 5th question that your readers and visitors from the meme answer when they visit! This post goes live on Sunday evenings. 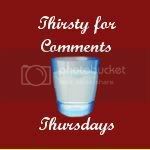 Thirsty for Comments - a chance to link up and share a post that you'd like more comments on - the hope of this meme is that people will visit and leave meaningful comments after reading your post and that you'll do the same for other blogs! This post goes live on Wednesday evening.